The VITPILEN 701 is an immaculately designed street bike that offers a new perspective on urban motorcycling. Driven by a powerful single-cylinder engine, this compact and agile motorcycle is expertly crafted to deliver minimalist styling with exceptional performance and reduced to the bare essence of what a motorcycle should be. Created to suit the unique, progressive lifestyle of modern motorcycling, it delivers a more thrilling, honest and real bike experience. 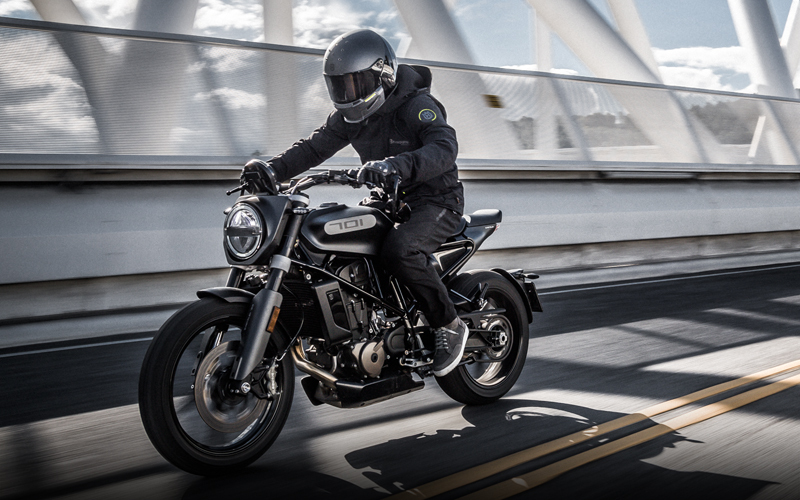 The VITPILEN 701 is powered by a modern 692.7 cc liquid cooled, single-cylinder engine that features the latest design and electronics technology. With a peak horsepower of 55kW (75hp) and 72Nm of torque at 6750 rpm, there is no doubting this motorcycle´s performance potential. The electronic fuel injection is operated by a ride-by-wire system and delivers immediate, sharp and refined power controlled by a standard traction control system. The latest technical solutions such as standard up & down easy shift deliver exceptional ride-ability while innovative production processes and the highest quality materials ensure premium reliability and efficiency, resulting in a long 10,000 km service interval. The exhaust system on the VITPILEN 701 comprises two parts, a pre-silencer made from steel, and a final silencer, which is finished off with a black coating. The design is integrated in the VITPILEN style and importantly, also ensures the VITPILEN 701 meets strict emissions regulations. The VITPILEN 701 is fitted with hydraulic Brembo disk brake callipers, which are manufactured to the highest standards, and in combination with 320mm front and 240mm rear perforated steel discs, deliver controllable and confident braking performance.The VITPILEN 701 is also fitted with a state-of-the-art Bosch ABS system, ensuring the highest level of safety in varying braking conditions. This function can be fully disengaged for more advanced riders. The suspension on the VITPILEN 701 is produced by WP performance systems and is made to exacting standards, ensuring the highest level of quality and craftsmanship. The front suspension features upside down 43 mm forks, while the rear features a monoshock, connected via a linkage to the swingarm. The high-quality components are fully adjustable for constantly changing urban environments.